"During the Great Depression, thousands lived on the brink of starvation. Many perished. In 1935 President Franklin D. Roosevelt created the Works Progress Administration under this 1933 New Deal initiative. The WPA was designed to get people back on their feet. Many of the original New Deal programs required heavy physical labor. WPA workers built hundreds of schools, health clinics, roads, park facilities, and community center. Many of our highways, schools, and power plants were built by WPA workers. Most of these projects were considered "men's work." However, by 1935, with so many women heading households and ending up on the relief rolls, it was clear that employment for them was essential. Thus a real effort was made to create jobs to put women to work and take them off the dole. The new jobs included work in health services, school lunch programs, sewing projects, and libraries. One of its most innovative programs was the Pack Horse Library Project of Eastern Kentucky. It was during the time of the WPA that many areas of country, particularly poor rural areas, received free public library service. Thousands of people lived in the crooks and hollows of Kentucky's mountains. Without newspapers, telephones, or radios, they were almost totally isolated from the outside world. Since there were not paved or even gravel roads, the only way in was by foot, horse, or mule. People followed creek beds and mountain paths to their tiny communities and homes in the hollows. Small one-room schoolhouses nestled in coves and mining camps were almost entirely removed from the outside world. These schools barely had enough textbooks for their students. Some had no books at all. In face of the daunting essential needs, food, clothing, medicine, employment, funding for libraries seemed a very low priority. Without enough money to feed their bodies, how in the world could money be found to "feed their minds?' asked First Lady Eleanor Roosevelt. The answer came in the form of an ingenious WPA program known as the Kentucky Pack Horse Library Project. "The way it worked was simple: The WPA paid the salaries for the librarians to maintain a headquarters library, usually at the county seat, and to carry books on horseback throughout the county. The Kentucky pack horse librarians were tough. They had to be in order to travel atop horses and mules over the rockiest terrain, through all kinds of weather, carrying books and magazines up and down creek beds named Hell-for -Sartin, Troublesome, and Cut Shin because of their treacherous natures. The book women were dedicated. Although their salary was only $28 a month, they were proud of the work they did. Taking books to people who had never had access to them before was not only hard work, it was important work. "The people the librarians served in those isolated hills and hollows were their neighbors and friends. They wanted the same things their neighbors did - a better life, a better education, and some knowledge of the outside world. "Magazines were far more poplar than books, especially practical magazines such as Women's Home Companion and Popular Mechanics. 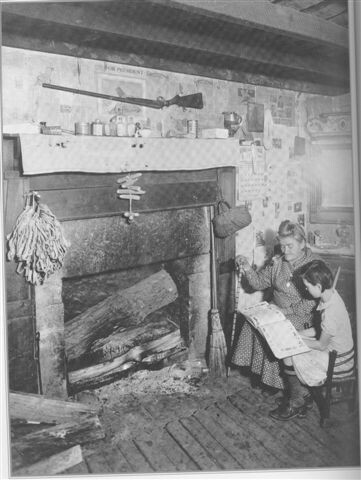 The mountaineers were hungry for ways to improve their lives, and they found the magazines on home health care, cooking, agriculture, child care and machinery particularly helpful. Always, children's books were in the greatest demand, and there were never enough of them. And they weren't just for kids. Many adults who had never learned to read liked them because the pictures helped them figure out the stories. Sometimes, the children of the household read out loud to the adults and actually helped their parents and grandparents learn to read. "Despite its problems, and the ongoing shortage of materials, the Pack Horse Library Project was considered a rousing success story. But success sometimes carried with it other problems. For instance, one family complained that their son's new nightly reading habits meant they had to purchase more lamp oil. Another parent grew irate over the fact that he could not get his children to do their chores because all they wanted to do was sit and read. Still, the benefits far outweighed the drawbacks. Over 100,000 people participated in this service which provided a meaningful escape from their troubles. "Unfortunately, the pack horse libraries did not last long. In 1943, the project ended with the dismantling of the WPA. Without the WPA, pack horse libraries could no longer pay their workers, and one of the most well-liked rural outreach services was discontinued. 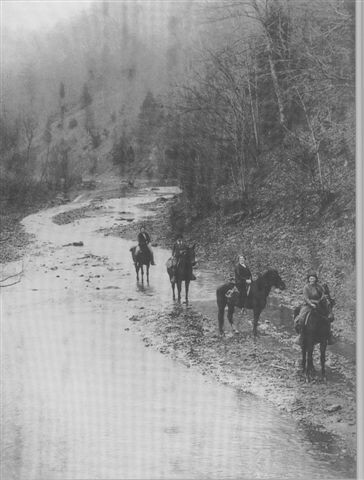 In a letter written by one of the young pack horse workers, Gladys Lainhart said, "It would be difficult to estimate how much this good work is doing to brighten the lives of the people in our Kentucky mountains." "The Kentucky Pack Horse Library Project and its book women deserve credit for their services, and acknowledgment for their part in library history - indeed in the very history of our country. What they gave to their constituents couldn't be measured in money, for what they gave was no less than the keys to the world."